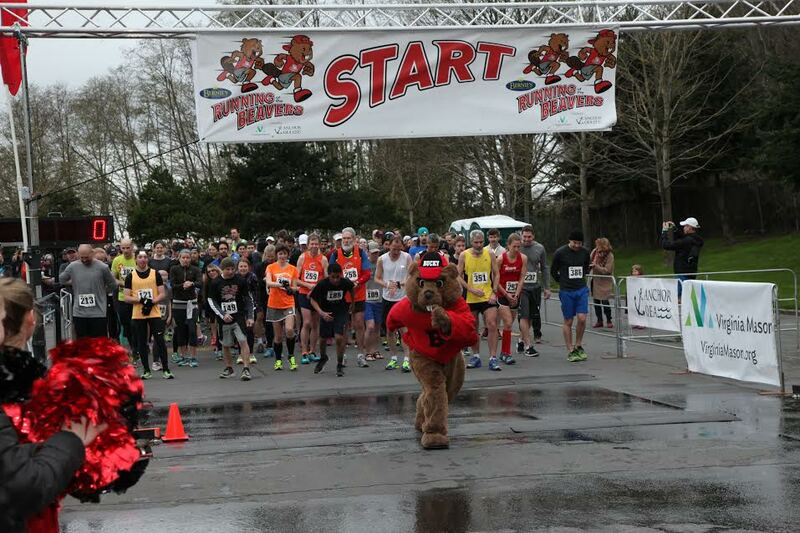 About the photo above: Bucky the Beaver leads the charge of runners on Saturday. Photo by Rowland Studio. A community of runners and walkers (and dogs) participated in the 1st annual Bernie’s Automotive Running of the Beavers 5K. The event started at Ballard’s beautiful Golden Gardens Park running along the Shilshole Bay waterfront returning to finish at the Park. The Ballard High School Band and Cheer squad entertained the participants along with a special appearance by Bucky the Beaver. All proceeds from the event will go to the general fund of the Ballard High School (BHS) Foundation. The BHS Foundation is a non-profit charitable organization with a mission to support the students, faculty and administration of Ballard High School and enrich the school’s programs and activities. The first-time event attracted over 300 runners and raised over $20,000 for the Foundation! Sponsors for the event included Virginia Mason and Anchor QEA as the presenting sponsors along with Les Schwab, Covich-Williams, Ballard Oil, Umpqua Bank, Windermere, Limback Lumber, The Lockspot, El Camion, Jody & Derek Clovis, The Goodman Foundation, and the Lee Family. BHS graduate Alex Bowns won the event and Erica McElrea was the fastest female participant. The Foundation hopes to build on this initial event and make it a tradition for years to come. Thank you to Bernie’s Automotive for sponsoring this event! Bernie’s is located at 4420 Leary Way NW in Ballard’s West Woodland neighborhood.